Gluck, detail of a portrait by Joseph Duplessis, dated 1775 (Kunsthistorisches Museum, Vienna). 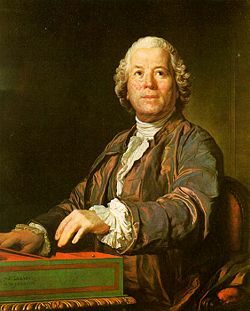 Christoph Willibald (von) Gluck (July 2, 1714 – November 15, 1787) was a German composer, one of the most important opera composers of the Classical music era, particularly remembered for Orfeo ed Euridice. He is also remembered as the music teacher of Marie-Antoinette who as Queen of France promoted Gluck and was his patron. Some regard him as the father of the Rococo and Classical age of music—at least in Opera. Gluck's operatic reforms, eliminating all that was undramatic, were a turning point in the history of the medium. Gluck lived during a time of political and social volatility with the advent of the French and American revolutions as well as the Napoleonic wars. He was most affected by these massive historical changes and featured the dramatic in his operas as a way of speaking to the populace about human responsibility and personal and moral transformations. Gluck would have agreed with the values as stated in the Universal Peace Federation which affirm taking responsibility for one's own personal, spiritual and moral transformation. Gluck was born in Erasbach (now a district of Berching, Bavaria) the first of nine children. His father came from a long line of foresters; nothing is known about Gluck's mother, neither her ancestry nor her maiden name. In 1717, the family moved to Bohemia, where the father became head forester in the service of Prince Philipp Hyazinth von Lobkowitz in 1727. Little is known about Gluck's early years or his education. Gluck later wrote: "My father was a head forester in [Eisenberg] in Bohemia and he had brought me up to follow in his footsteps. At that time music was all the rage. Unfortunately, inflamed with a passion for this art, I soon made astounding progress and was able to play several instruments. My whole being became obsessed with music and I left all thoughts of a forester's life behind." If Gluck's own account is to be believed, he ran away from home. "One fine day, with only a few 'groschen' in my pocket, I secretly left my parents' house and wandered...in a roundabout way towards Vienna. I earned my food and lodging with my singing. On Sundays and holidays I would play in the village churches." Gluck's memories of his youth are somewhat mistaken. The first city he visited was not Vienna, but Prague, where in 1731 he studied logic and mathematics. However, it is not known whether he finished a degree. He was reconciled with his father, whose opposition to his son's musical vocation had driven him from home. Gluck probably settled in Vienna before 1736. From Vienna he traveled to Italy, probably arriving in Milan in 1737. He soon began to follow his true vocation, finding a place in the Milanese orchestra, where he got to know the inner workings of the opera house. He was given lessons in composition by Giovanni Battista Sammartini and his works were soon enjoying successes on the Italian operatic stage. His first opera Artaserse was performed on 26 December 1741, when Gluck was 27 years old. This and the following works Gluck composed were conventional examples of opera seria. Gluck embarked on further journeys through Europe. In London, La Caduta de' Giganti was performed on January 7, 1746, followed by Artamene on March 4. Neither opera had much success. In the same year Gluck published six trio sonatas, which had probably been written in Italy. Gluck joined a traveling opera company led by Pietro Mingotti. Such companies would visit towns without a permanent opera house. The first of Gluck's operas known to have been played by Mingotti's troupe was performed at a double wedding for the ruling house of Saxony in Dresden on June 29, 1747. For the birthday of Maria Theresa of Austria, the company staged La Semiramide riconosciuta (May 14, 1748). The following year La contesa de' numi (April 9, 1749) appeared at the royal court in Copenhagen. On September 15, 1750, Gluck married the 18-year old Maria Anna Bergin in the church of Saint Ulrich in Vienna. Gluck was twice the age of his bride. She was the well-off daughter of a Viennese businessman and brought a lot of money with her dowry, enabling Gluck to become economically independent. Gluck finally settled in Vienna where he became Kapellmeister. He wrote Le Cinesi for a festival in 1754 and La Danza for the birthday of the future Emperor Leopold II the following year. After his opera Antigono was performed in Rome in February, 1756, Gluck was made a Knight of the Golden Spur by Pope Benedict XIV. From that time on, Gluck used the title "Ritter von Gluck" or "Chevalier de Gluck." Gluck turned his back on Italian opera seria and began to write opéra comiques. In 1761, Gluck produced the groundbreaking ballet Don Juan in collaboration with the choreographer Gasparo Angiolini. The climax of Gluck's opéra comique writing was La rencontre imprévueof 1764. By that time, Gluck was already engaged in his operatic reforms. Gluck had long pondered the fundamental problem of form and content in opera. He thought both of the main Italian operatic genres—opera buffa and opera seria—had strayed too far from what opera should really be. They seemed unnatural, the singing in opera seria was devoted to superficial effects, the content was uninteresting and fossilised. Opera buffa had long lost its original freshness, its jokes were threadbare, the repetition of the same characters made them seem no more than stereotypes. In opera seria too, the singers were effectively absolute masters of the stage and the music, decorating the vocal lines so floridly that audiences could no longer recognize the original melody. Gluck wanted to return opera to its origins, focusing on human drama and passions, and making words and music of equal importance. In Vienna, Gluck met likeminded figures in the operatic world: Count Giacomo Durazzo, the head of the court theatre, who was a passionate admirer of French stage music; the librettist Ranieri de' Calzabigi, who wanted to attack the dominance of Metastasian opera seria; the innovative choreographer Gasparo Angiolini; and the London-trained castrato Gaetano Guadagni. The first result of the new thinking was Gluck's reformist ballet Don Juan, but a more important work was soon to follow. On October 5, 1762, Orfeo ed Euridice was given its first performance, with music by Gluck to words by Calzabigi. The dances were arranged by Angiolini and the title role was taken by Guadagni. Orfeo showed the beginnings of Gluck's reforms and the opera has never left the standard repertory. Gluck's idea was to make the drama of the work more important than the star singers who performed it, and to do away with dry recitative which broke up the action. The more flowing and dramatic style which resulted has been seen as a precursor to the music dramas of Richard Wagner. Gluck and Calzabigi followed Orfeo with Alceste (1767) and Paride ed Elena (1770), pushing their innovations even further. Calzabigi wrote a preface to Alceste, which Gluck signed, setting out the principles of their reforms. Gluck now began to spread his ideas to France. Under the patronage of his former music pupil, Marie Antoinette, who had married the future French king Louis XVI in 1770, Gluck signed a contract for six stage works with the management of the Paris Opéra. He began with Iphigénie en Aulide (April 19, 1774). The premiere sparked a huge controversy, almost a war, such as had not been seen in the city since the Querelle des Bouffons. Gluck's opponents brought the leading Italian composer, Niccolò Piccinni, to Paris to demonstrate the superiority of Neapolitan opera and the "whole town" engaged in an argument between "Gluckists" and "Piccinnists." The composers themselves took no part in the polemics, but when Piccinni was asked to set the libretto to Roland, on which Gluck was also known to be working, Gluck destroyed everything he had written up to that point. On August 2, 1774, the French version of Orfeo ed Euridice was performed, with the title role transposed from the castrato to the tenor voice. This time Gluck's work was better received by the Parisian public. In the same year Gluck returned to Vienna where he was appointed composer to the imperial court. Over the next few years the now internationally famous composer would travel back and forth between Paris and Vienna. On April 23, 1776, the French version of Alceste was given. Gluck also wrote Armide (1777), Iphigénie en Tauride (1779) and Echo et Narcisse for Paris. During the rehearsals for Echo et Narcisse, Gluck suffered his first stroke. Since the opera itself was a complete failure, Gluck decided to return to Vienna. His musical heir in Paris was the Italian-Austrian composer Antonio Salieri, who had made friends with Gluck when he arrived in Vienna in 1767. Gluck brought Salieri to Paris with him and bequeathed him the libretto for Les danaides. The opera was announced as a collaboration between the two composers; however, after the overwhelming success of its premiere on April 26, 1784, Gluck revealed to the prestigious Journal de Paris that the work was wholly Salieri's. In Vienna Gluck wrote a few more minor works but he generally lived in retirement. In 1781 he brought out a German version of Iphigénie en Tauride and other operas of his enjoyed great popularity in Vienna. On November 15, 1787, in Vienna, Gluck suffered another stroke and died a few days later. At a formal commemoration on April 8, 1788 his friend and pupil Salieri conducted Gluck's De profundis and a requiem by the Italian composer Jommelli was given. Like many other prominent musicians and painters, Gluck was buried in the Matzleinsdorfer Friedhof. When this cemetery was turned into a park in 1923, Gluck's remains were transferred to a tomb in the Vienna Zentralfriedhof. Gluck's musical legacy included about 35 complete operas, together with numerous ballets and instrumental works. His operatic reforms influenced Mozart, particularly his opera Idomeneo (1781). Gluck left behind a flourishing school of disciples in Paris, who would dominate the French stage throughout the Revolutionary and Napoleonic period. As well as Salieri, they included Sacchini, Cherubini, Méhul and Spontini. Gluck's greatest French admirer would be Hector Berlioz, whose epic Les Troyens may be seen as the culmination of the Gluckian tradition. Though Gluck wrote no operas in German, his example influenced the German school of opera, particularly Weber and Wagner, whose concept of music drama was not so far removed from Gluck's own. IMSLP - International Music Score Library Project's Christoph Willibald Gluck page. History of "Christoph Willibald Gluck"
This page was last modified on 20 February 2017, at 17:43.